can be made up to eight hours ahead of serving. How many three bean salads can one have? There are plenty of them around but we never get tired of them. They're healthy and tasty and full of nutrition. This particular 3 bean salad utilizes a great dressing that spices it up a little while keeping it light on fat and low on sugar! Bean salads are some of our favorites because they not only taste great but provide a decent amount of fiber and protein as well. 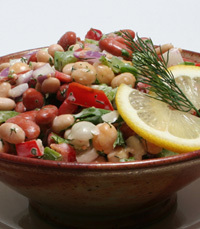 This 3 bean salad is a great recipe adapted from a contribution by our friends at the AICR. pepper and whirl to combine. With the motor running, drizzle in oil. Add dressing to beans and mix to combine.